It seemed night had fallen a little earlier than usual for a summer evening as I pulled into the driveway tucked off a residential street on Miami Beach. The house sat quiet in a nest of palms, casting light from the pores of its winding single story footprint, a midcentury South Florida home in the truest sense. One pane in particular fluttered, beckoning as I approached to peer inside. There was Gary Rosenberg, bustling inside his 12′ x 12’ converted garage ceramics studio, not unlike my first apartment in New York City. I think we called it a shoebox. I knocked on the door and stepped back in time to 10th grade studio art class. It felt great, and the usual suspects were all there. First the damp, intoxicating smell of clay. And clay was everywhere. The floor, the wheel, Gary’s overalls… and me, already, even without sitting down to take a test drive and see if I remembered a thing or two. One thing was for certain. Whatever I didn’t recall, Gary was going to show me. “I first really got into it in 1973. I apprenticed under Eddie Weyhe,” Gary begins. “He was a painter and potter in Coconut Grove I met when I was 17. He was very artistic and had a great sense of design. The way he threw was amazing. He had this Florida Room in his house with one all-white wall, and he would take some charcoal and sketch his next piece, including the decoration. He worked in three sections. The final product would be 6-8 feet tall! Gary’s beginnings behind the wheel. Gary is a commercial real estate broker, running his business as a family operation with his son Andy. And he is an artisan in the truest sense. He is also a blacksmith, certified hypnotist and comedian. 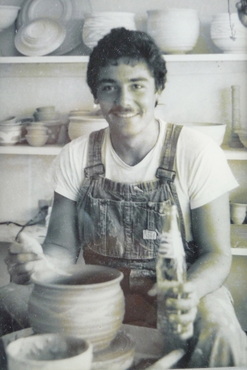 Pottery is not quite an art and not quite a hobby for this Beach High grad. He approaches it as a craftsman. The work is functional, and he produces a lot of it out of this tiny studio he built 11 years ago. And that was the reason for my visit. Production. Michael met Gary at a poker match 10 years ago, and they have been part of the same group ever since, not to mention neighbors and friends. Not surprisingly, Chef is a great fan of his work. If you look closely, you’ll notice some pieces at Michael’s Genuine Food & Drink that have been there pretty much since the beginning. There’s the business card bowl at the host stand and the perforated bowl in the center of our ingredient wall on the food bar. This evening it would be an order for new radish bowls for our bar keeping Gary on his toes. I would learn – through participation thanks to a great teacher – how they were made, from centering, opening and pulling, to trimming in their mid-dry leather stage with his set of custom made Tungsten Carbide tools. Gary explained that after the first or Bisque firing in the kiln just under 2,000 degrees Fahrenheit, the piece will shrink 15%, making his measuring stick even that more important when an order as specific as Michael’s comes in. I began two pieces that night — a small vase and a plate with a shallow lip, and gained a Gary trick that he learned from his mentor for centering the clay by pushing it forwards on the wheel and letting it come back. As I closelined each piece from its bat, the removable attachment to the base of the wheel on which you “throw” the clay, and placed them on the shelf to dry it became clear that Gary is like any great sushi master. A Shokunin. He both makes individual pieces each imbued with character, thanks to signature lines and textures applied that harness the glaze, but he has standardized a look that he can reproduce with profound prolific effect. A family guy through and through, and one we are proud to call part of the extended Genuine family as well. Michael takes another turn at the wheel soon when it’s glazing time. Can’t wait to see how he makes his mark.